The UAE is committed to creating a sustainable future as demonstrated by its sustainable economic policies – the UAE Vision 2021, the 2030 Green Agenda, UAE Centennial 2071 and the UAE Energy Strategy 2050. Adoption level of sustainable initiatives by UAE organisations is increasing as more businesses realise the social, economic and environmental benefits. At Summertown Interiors, we are unwavering in our commitment to being sustainable and strive to be early adopters of environmentally sustainable initiatives – big and small. 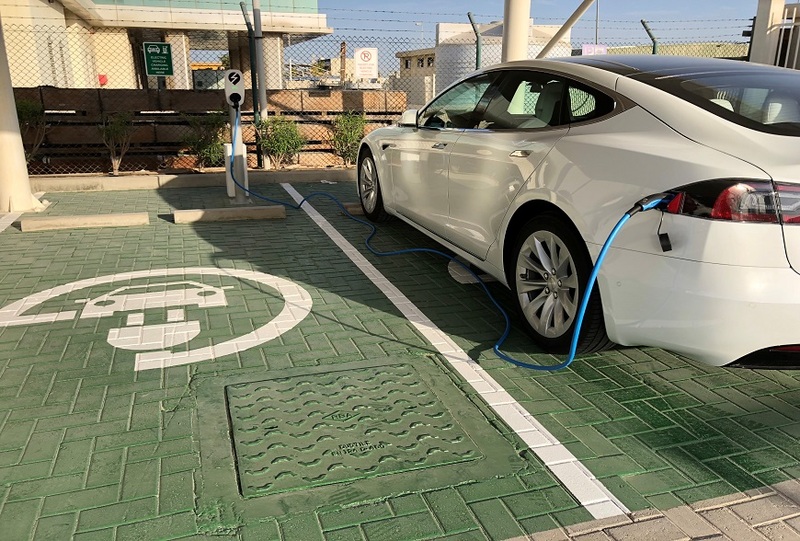 This February we installed an electric car charging station for electric and hybrid vehicles at our headquarters in Dubai. The station has two dedicated car parks with one vehicle charger fitted with a universal plug enabling it to charge all electric and hybrid vehicles. The cost of charging is free for all Summertown employees and visitors to our office. By providing infrastructure like the electric car charging station, we aim to help our staff embrace a sustainable lifestyle. Not only are electric vehicles cheaper to run and maintain, they produce fewer emissions that contribute to air pollution and climate change than conventional vehicles. It also means we are contributing to help Dubai achieve its Clean Energy Strategy, which aims to see the Emirate produce 75% of its energy requirements from clean sources by 2050. Similarly, the UAE Energy Strategy 2050 aims to increase clean energy usage by 50%. Since the Electric Vehicle Green Charger Initiative was launched by DEWA, 100 electric vehicle charging stations have been installed across Dubai including government offices; clinics and hospitals; gas stations; Al Maktoum International Airport and Dubai International Airport; shopping malls such as Marina Mall; commercial spaces including Dubai Design Districts and residential complexes and establishments such as Jumeirah Beach Hotel. By the end of this year the government entity aims to have installed a further 200 stations. To further encourage the use of electric vehicles in Dubai and to contribute to the protection of the environment, DEWA is also offering free charging for electric vehicle owners registered in the Green Charger initiative from 1 Sept 2017 to 31 Dec 2019. In 2016 the government set a target to encourage citizens purchasing new cars to invest in electric or hybrid vehicles from 2016 to 2020 to increase by 10%. It is expected that the number of electric and hybrid cars will rise to 2% by 2020, and 10% by 2030. But it’s not up to governments alone. The private sector companies like Summertown, have an important role to play in encouraging it’s people to switch to electric vehicles – be that through incentive schemes or driving early adopter behaviour among our staff. Now that we have our own electric car charging station, we hope it will encourage our employees to evaluate investing in an electric car in the future and to continue to think of alternatives ways to reduce our carbon footprint including ‘carpooling’ to work.